Concert Diary: The Pillows at the Gramercy Theater NYC — Oh no, Anime! It’s 2003. I’m sitting in my friend’s dark, quiet living room late one night having just watched Katsuhiro Otomo’s Memories for the first time. I don’t remember how much of it my 12-year-old brain grasped, but I’m guessing not much. What I do remember is that my friend had something else to show me that night, and this thing I definitely didn’t understand. It was bizarre, inexplicable and intensely unfamiliar. Six episodes of varying assaults on the senses. But at the end of it all, after watching all six episodes in one sitting, it stuck with me. The weird, quirky characters, the eye-opening visuals and mostly importantly, the music. I was by no means an expert on anime in my youth but even I could tell that an entire series scored with rock music wasn’t the norm. This wasn’t just any rock music, either: it was mellifluous, nostalgic and cacophonous in equal measure. A perfect match for the wild swings in mood shown on-screen. Eventually, I would have to know more. 2006. I’m starting my sophomore year in high school and, after catching one of Adult Swim’s hundreds of FLCL reruns, I’ve decided to finally track down some of the music from the show. After some cursory research I begin turning to Limewire to find myself a little piece of this band called The Pillows (don’t @ me we were all doing it back then). “Ride on Shooting Star”, “Little Busters” and “Bran new Lovesong” are the soundtrack to my second year of high school. I begin making the memories that will forever be summoned in the nostalgia those songs produce, and lay a meaningful foundation for things to come. 2013. I’ve just graduated from college with zero prospects for a job in my field. I’m living week-to-week thirty minutes outside Tallahassee, FL in a run-down house on a dirt road, and working a dead-end job at an appliance store. Years stumbling through college in a highly co-dependent and emotionally toxic relationship have left me crippled by anxiety and clinically depressed. To top it all off, my girlfriend of three years has just broken up with me over the phone shortly after moving away. The dreaded post-college slump has hit me hard. Days after the breakup, I’m making the 300-mile drive to my hometown of Tampa in my beat-up Pontiac, seeking some small measure of escape from whatever the hell my life has turned into. Blaring from the speakers is a band that has pulled me through most of college, most of my youth, and truthfully, most of my life: The Pillows. As “Hybrid Rainbow” plays, I sob uncontrollably. Heaving, racking cries that feel like my spirit leaving my body. It’s the first true catharsis I’ve felt in years. 2015. I’m in a better place, living comfortably in my hometown with a steady, well-paying job and a loving circle of friends. Since the year previous I’ve started watching a mind-boggling amount of anime, and through it am re-discovering and further exploring the anime I loved as a kid. As part of this process, I start listening to The Pillows more than I ever did. I download every album they’ve recorded since their FLCL days and listen to them all in succession, discovering a band that has evolved and changed while keeping their fundamental spirit intact. I connect with them and their music on a completely new level, realizing as I listen to more and more Japanese music that they are indeed a diamond in the rough. Realizing they are not only my favorite Japanese band, but my favorite band, period. Experiencing everything they’d done since that night in my friend’s living room over a decade ago only solidifies this further. July 12th, 2018. I’m walking through New York City’s Flatiron district in the early evening. It’s hot, but not unbearably so (I’m from Florida, after all) and the street is bustling with rush hour traffic. At the Gramercy Theater, the line to get in is already halfway around the block for the 7pm show. I circle the block and meet up with an old friend at the end of the line, immediately beginning to reflect on our individual history with tonight’s band, other people around us in line chiming in with theirs as well. The atmosphere is jovial and excited as the line starts moving. My body’s already tired from a day spent on my feet, but I don’t feel it. I’m about to see The Pillows. 15 years of waiting is about to be satisfied. American singer/songwriter Cullen Omori was the first of two openers at The Pillows’ Gramercy Theater show (and the rest of the stops on this tour). I don’t have much to say about him since I didn’t know his music going into this, and I spent most of his (surprisingly lengthy) time on stage downstairs buying merch and saving what was left of my stamina. What I did hear reminded me of Pink Floyd combined with the Flaming Lips, and seemed to fit the rock n’ roll theme of the show well enough. Again though, his set went on for way longer than I think anyone in attendance expected. Next up on stage was the Japanese alternative rock band Noodles, the second and more anticipated opening act for the night for me. They’re a long-running alt-rock band that exists within the exact same milieu as The Pillows, with lead singer Yoko recently forming a new band called Casablanca with Pillows frontman Sawao Yamanaka. I don’t know their work as well as I do The Pillows, but that’s not a very meaningful stick to measure anything against considering I don’t know anyone’s work as well as I do The Pillows. Their lineup for the night was a bit modified (for reasons unknown to me), with regular members Yoko (vocals/guitar) and Ikuno (bass) being joined by none other than Pillows drummer Shinichiro Sato, whom Yoko called “Shin-chan”. This proved to be a very welcome addition, as Sato’s skills at drumming live are unshakably solid. Noodles are known for their laid-back, almost lazy sound in their studio recordings, but that wasn’t the impression I got from their live presence at all. They seemed a bit timid or understated during their first few songs, perhaps feeling out the room and recognizing that despite their appearing with one of the most popular Japanese rock groups in America, they themselves were relatively unknown in the states. However, I was incredibly happy to see and hear that the crowd at the Gramercy that night were enthusiastically receptive and supportive of Noodles, and made them feel every bit the rock stars of prodigious stature that they are. Fifteen minutes into the set and their sound opened up, making proper use of Sato’s powerful and driving drumming style to pump some well-needed energy into the crowd. Noodles’ set lasted a full hour, playing some tracks that I recognized as well as plenty that were new to me. In particular, I was happy to hear several tracks from their 1995 debut album The Gravity Thief, as well as perhaps their biggest hit called “Love my Life”, from the hit 2006 film of the same name. It’s a nostalgic and mellifluous power ballad that plays upon emotions in much the same way that songs by The Pillows do, and that’s exactly why I think Noodles was a perfect opener for this tour, and furthermore why I feel privileged to have been able to see them. I’m fairly confident that it won’t happen again, at least not in the states. After another lengthy period of changing out and sound-checking instruments, it was finally time for The Pillows to take the stage. Two trailers, one for FLCL Progressive and one for FLCL Alternative, played on a projector behind the stage before the band even came out, as if there were any remaining worries that this wouldn’t be an entirely FLCL-centric show. The three original members of The Pillows took the stage: Sawao Yamanaka on guitar and vocals, Yoshiaki Manabe on lead guitar, and Shinichiro Sato on drums. Joining them was their unofficial fourth member Yoshinori Arie on bass, the latest name on a short list of regular bassists The Pillows have had since their early years, who’s been playing with them officially since late 2016. Despite the fact that all of them are in or approaching their fifties, all the members of The Pillows exhibited a youthful exuberance at being on stage in New York from the moment they confidently strode out onto the Gramercy’s modest stage. Opening with the FLCL-original track “I Think I Can”, Yamanaka set the tone for the rest of the show by brazenly stepping one foot up on the monitor at his feet, bashing out the opening bullfighting chords like he was shooting the music at us instead of playing it. The Pillows often have a tendency to play songs a lot quicker live than in their studio counterparts, but starting with “I Think I Can” and continuing throughout the show it seemed like they were purposefully playing it a lot closer to the original studio tempos. I can’t tell if it was just the pure adrenaline running through my system that made it seem that way, but either way it created an atmosphere of intense, intimate familiarity with the music that made the crowd roil and cry and scream with excitement. Once the opener was in the books, Yamanaka didn’t waste any time cuing up “Freebee Honey”, a fast-paced number from their 2003 album Penalty Life, which was re-recorded and featured as part of the soundtrack for FLCL Progressive. It wouldn’t be the only track used in Progressive that would show up during the set either, but we’ll get to that later. Next up was “Carnival”, a recognizable but not necessarily famous track from the original FLCL soundtrack. Fans of the original series would recognize it mostly as an instrumental in terms of its use in the show, and I was honestly surprised and then delighted to hear it performed live considering that hadn’t actually been done in quite some time. Clearly tonight and indeed the entire tour was meant to be a treat specifically for FLCL fans, and I was happy though still a bit dazed to be along for the ride. The next two tracks finally woke me from my initial stupor at just what the hell I was doing, since they’re both FLCL classics and indeed Pillows classics in their own right: “Blues Drive Monster”, followed by “Crazy Sunshine”. These two are pretty similar songs musically- they’re both driving, mid-tempo rock n’ roll tunes with soaring vocals, punctuated and syncopated guitar/drum sections, and most importantly English choruses. That last part proved to be the final piece of the puzzle the audience needed to reach new heights of insanity, beginning a trend of the entire packed hall scream-singing every English word they could, which would last the rest of the night. I was right there with them, and as I screamed “CRAAAZYYYY SUUUNSHIIIINE” until I was hoarse, the memories associated with both that song and its place in FLCL began flooding back, beginning an emotional crescendo that would eventually spill over towards the end of the show. Next up was a song that was a little surreal hearing live at a FLCL-themed Pillows show, only because it’s a song that I’ve thought for years would make the perfect ending theme to a FLCL sequel series long before one was ever announced. Despite the fact that it wasn’t used as an ending theme, “The Third Eye” was one of two songs used in FLCL Progressive from the 2006 album My Foot, arguably The Pillows’ best album of the 2000s. After that was a song that needed no introduction, and it didn’t really get one besides Yamanaka screaming its name over the din: “Ride on Shooting Star”. This is pretty much the Pillows song, and was the ending theme to the original FLCL as well as one of two completely original tracks (along with “I Think I Can”) composed exclusively for the first series. I don’t really know how much I can say about it, or their performance of it, that isn’t something that’s already been written, so I’ll just say this: it was every bit as righteous as I thought it’d be live. “Spiky Seeds” and “Star Overhead” came in quick succession next, the ending themes to FLCL Progressive and FLCL Alternative respectively. I’ve been a huge fan of “Spiky Seeds” in particular ever since it debuted in the FLCL Progressive announcement trailer at Anime Expo last year, and seeing it performed live created a really interesting routine in the crowd. We swayed and grooved during the verses, exploding with more and more ferocity every time the chorus hit, jumping and cheering in time with the song. I hope this crowd reaction sticks around on the rest of the tour because it was a really fun exercise in musical crowd control, and even more fun to be a part of. After that, easily one of The Pillows’ most emotional and impactful power ballads: “ONE LIFE”. This was the beginning of the end for me emotionally, as the combination of incredibly meaningful music, an exciting live environment, the incredibly high temperature inside the Gramercy and my building exhaustion created a trance-like state within me that allowed me to experience the memories associated with these last songs in real-time. By the time “Funny Bunny” started I was an emotional wreck, but still managed to hold it in. I felt like Mamimi at the end of the first episode of FLCL; about to “overflow”, the intense nostalgia and excitement at being able to be in that exact place on that exact night boiling over and reaching critical mass. Despite the fact that I’d screamed myself hoarse almost immediately, I somehow managed to both remember the Japanese lyrics to “Funny Bunny”’s chorus and sing them out as loud as best I could, completely unable to hear my own voice but happy knowing I was contributing. “Funny Bunny” ended, Yamanaka screamed out “Ah-COME ON, LITTLE BUSTERS!” and I knew it was time to let it all out. The tears finally began to fall, I had held it in long enough and singing along with easily the best and most important of The Pillows’ contributions to FLCL and indeed to Japanese rock itself had opened the floodgates. “Little Busters” ended to cacophonous roars of approval, and when the crowd died down Yamanaka began soulfully strumming a series of dissonant chords that I recognized a lot sooner than most people in the crowd did (I watch a lot of their live DVDs, okay). “Can you feel? !” Came Yamanaka’s desperate cry from above us. “CAN YOU FEEL? !” He said, louder, more demanding. “Hybrid Rainbow” started, and it was immediately like I was looking back at a picture book of my life. The countless times I’d played The Pillows for hours and hours during my grueling work days over the past four years, driving all across Florida to who knows where. Sitting at a rest stop in 2013, playing The Pillows so loud so as to not hear my own thoughts, heaving sobs from years of emotional confusion, anxiety and depression racking my body. Riding my bike to high school early so I could listen to The Pillows before having to go through that day’s process of figuring out what kind of person I’d be. And finally, fifteen years ago in my friend’s dark living room, unknowingly setting out on a frightfully long journey that would put me here, now. This was the first time that it felt real: I was seeing my favorite band live, for the first and probably last time, and they were playing everything I wanted to hear. I was crying, screaming, laughing, singing, and jumping. Normally, this is where an article like this would end, and I’d be able to tie a nice little bow on my experience with the moment I cried the hardest. Unfortunately, The Pillows played three more songs after “Hybrid Rainbow”, ruining my hopes for a positively cinematic end to this write-up but allowing the show to end in an even more spectacular fashion. The last song before the encore was “Advice”, the main FLCL battle theme and another song The Pillows haven’t played live in years. It started amazingly, with Yamanaka playing the main riff slowly, eventually speeding up and adding Sato’s drums before starting the track itself and sending the crowd roiling and bouncing off each other. 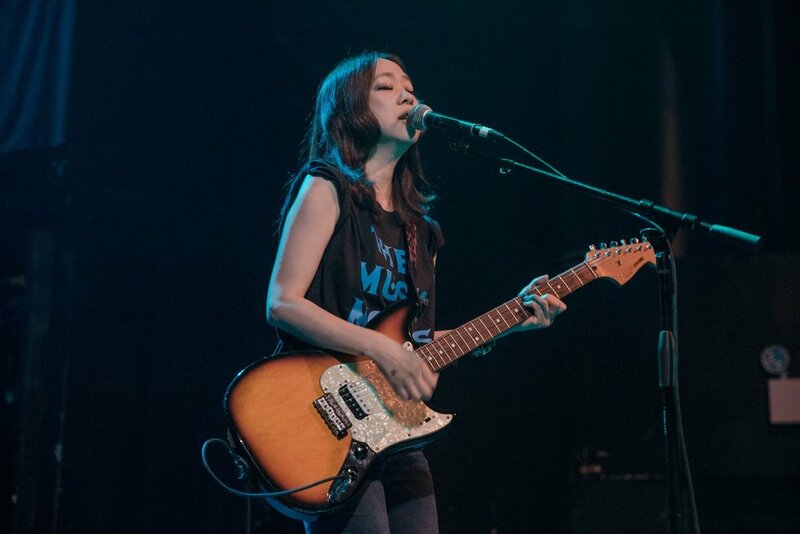 The encore consisted of “Thank You, My Twilight”, a main musical motif in FLCL Progressive and popular song from the 2002 album of the same name, and “Last Dinosaur”. “Last Dinosaur” was the final reach back into the FLCL archives and a song that again, The Pillows had not regularly played live in quite some time. It also happens to be my favorite Pillows song, as it’s so emblematic of the sound they put forth in the late 90s: loud, melodic, fast and quirky. Its lyrics were always something I identified with as a sulky teenager, the tale the song tells about an ancient being crushing towns beneath its feet and accepting its sadness (literally the Last Dinosaur) something I thought I recognized in myself. Despite growing out of that mindset fairly young, it’s still a song that reminds me of a significant portion of my youth, and there’s really nothing like nostalgia to add that needed emotional punch. It’s a sensation I’m sure many longtime American fans of The Pillows are familiar with, and it meant a lot to me that they chose it as the note to end the show on. Spilling out into the streets of New York and feeling the cool, dry air of a summer evening on my sweaty skin, I felt much the same way I do now. Which is surprising, considering I’ve had a hell of a long time to mull over my experience before writing about it. I’m sure many of you reading this are familiar with this particular feeling I have, where you’ve been waiting so long for something to happen that when it finally does there’s a small tinge of disappointment buried deep inside all the elation and overwhelming joy of it all, a disappointment that feels like you don’t have anything to look forward to anymore. That combined with the fact that most of it still doesn’t feel real makes it an experience that’s still hard to write about, since most of it still seems so unknowable. Like I wasn’t supposed to understand any of it or be able to even articulate my incredibly complex feelings on it. After all, it’s not like I have any other experience in my life I’ve been waiting this long to have, so there’s nothing to measure it against. Hopefully I’ve been able to organize some of my more ascertainable thoughts here, and will be able to come back to it later in order to piece them together even further. Either way, I hope nobody interprets this last statement of mine as disappointment of any kind with The Pillows, because alongside these confusing emotions I’m digging through is the belief that seeing The Pillows live was the single greatest rock show experience I’ve ever had. Their skill and musicianship absolutely blew me away in every regard, and by the end of it the musical part of my brain was left shaken by what I had just seen and heard. As Joe would say, they are the Real Deal in every sense of the phrase. I don’t actually know how to end this long, rambling mess of a thing so I’ll just take this remaining space for some appreciation. First off, thank you (whoever you are) for reading this, as it’s easily the most personal I’ve ever gotten for anything I’ve made for Oh no, Anime! and it means a lot that anyone would read it. Thank you to all the new friends I made at and after the show, thank you Noodles for allowing me to check another box on my extremely long list called “J-Rock bands I need to see before I die”. Finally, thank you to The Pillows for being an inspirational force for over half my life, in part allowing me to see the beautiful world of animation and its limitless potential for the first time, and for giving me an experience I’ll vividly remember for the rest of my life. I wouldn’t be who I am today without your music. Thanks, Lostmen. It was a hell of a time.